‘Oh, yes we do,’ I teased, looking at my cards. I had a lousy hand, but I wasn’t going to let Hansel beat me. ‘Hurry up!’ he yelled at me, good naturedly, flinging a pillow in my direction, scattering my cards on the floor. I ducked, recovered the pillow and launched it back at him. I was staying the night at Hansel’s house. His father, the Baron von Leitner, had retired hours ago, and we were making our last night together in Vienna last as long as we could. Louis and his brother Thomas are French/Australian and their father works for the French Embassy in Europe. They have friends from all over Europe. The family are on holiday near Sarajevo when the Archduke is assassinated and before long, WWI is declared. This means that Louis and some of his friends will now be on different sides of this conflict. As the war begins and then continues through 1914, Louis and friends all make decisions about how to contribute. Louis is too young, and not fit to be a soldier, but he finds his own way to be involved. His decisions do not always keep him out of danger, and his family do not escape unscathed, but Louis stays true to himself and to his friends. ‘1914’ includes newspaper articles, photos, letters and other text types. 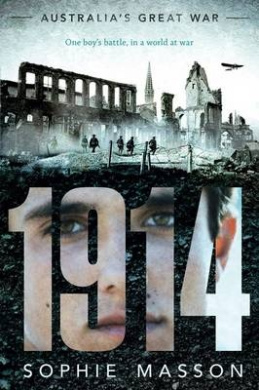 1914 is the first of what will be five independent novels about WWI. Each will have their own story and be written by a different author. Each will concentrate on a particular year of the war. Louis’s story includes a non-soldier perspective of the war and helps to introduce readers to one of the less well-known ways (actually more than one) that people were involved. Many readers may know how WWI began, but Masson takes them on location in Eastern Europe and allows them to feel the shockwaves that roll in so many directions. 1914 offers many opportunities for classroom discussion, including friendship, politics, loyalty and security. There was nothing Masha could do but stay. When Masha is kept captive by a greedy, but not-too-smart bear, she has to bide her time until an opportunity arises for escape. On the other hand, when a beautiful, but easily fooled, rooster is preyed on by a cunning fox, he needs the help of his wilier friends to get him out of trouble. Two Trickster Tales from Russia, as the title suggests, offers two retold folktales from Russia. With a lovely blend of traditional tale, well paced narrative and humour, coupled with a mix of colour and black and white illustrations, the book gives young readers a taste of stories from another time and culture. Available in paperback format, Two Trickster Tales from Russia is the first title from new Australian publisher Christmas Press, and is also available in Audiobook format, with the reading complemented by music and sound effects which help to bring the tales to life. A quality production Two Trickster Tales from Russia is delightful. Since the death of her father, Natasha’s family has fallen on hard times. So when someone must deliver a special painting that might turn their fortunes around, Natasha knows she must go. On the way home, a terrible blizzard forces her to seek shelter and, just as she thinks all is lost, she stumbles upon a beautiful mansion. Once inside she soon senses that something strange is afoot. When she finds a perfect red rose blooming in spite of the cold, she reaches for it – and finds herself soon coming face to face with the rose’s owner. Her terror at this fearsome man-creature gradually changes until she realises she loves him. But while that love could free him, nothing is simple, and instead Natasha must undertake a dangerous journey to save her new love. Scarlet in the Snow is a beautiful, engrossing fantasy for teen and adult readers. Readers will recognise this as a retelling of the fairy tale most commonly called Beauty and the Beast, but should not expect that this means they will know what happens, as Masson has truly made the story her own, blending fantasy and intrigue in a wonderful tale of adventure and romance. The exquisite cover is a good indication of the quality of the take within. And that’s when it hits me like a thunderbolt. The REAL reason people make mistakes in romance is that they imagine they’re in one kind of story but actually they’re in another! Ruby believes that real life romances, like romantic stories, fall into two categories – the Jane Austen-esque romantic comedy, or the Jayne Eyre gothic romance. The problem, though, is that people think they’re in one kind of romance when really they’re in the other – and so they fail. But because she knows so much, Ruby has the solution a Romantic Action Plan (RAP) to help her best friend Bella, her sister Jo, and even her mum find true love. What could possibly go wrong? The Romance Diaries: Ruby is a sweetly romantic diary format offering with a Jane Austen-esque mix of comedy, cads and drama. The first in a new series from ABC Books and Jenna Austen (a pseudonym of award winning author Sophie Masson), the story is told over three months of narrator Ruby’s life as she navigates the challenges of friendship, family and first love. Aimed squarely at tween readers looking for gentle romance novels, the series is sure to be a hit. A couple of the stories (The Two Gorillas, by Dubosarsky and The Gorilla Suit by Victor Kelleher) were previously published as part of Penguin’s Aussie Nibble’s series, and others have been published in School Magazine or by other publishers. Two stories (Charlotte the Explorer, by Dianne Bates and Look! by Lizzie Horne) appear here for the first time. Available from good bookstores or online from Fishpond. All are well targeted for five year old readers, each suitable for reading aloud in a single sitting. Early independent readers would also find the stories accessible. Kids love stories that are silly, accessible and quick to read – and Stories for Six Year Olds addresses all of these criteria, with eleven stories in the one volume, targeted for solo reading (or read-aloud with an adult) by readers of around six years of age. Some of the stories appear here for the first time, with others being brought back to life for a new generation of readers. Parker=Hamilton, for example, was written by Robin Klein in 1984 whilst The Stuck-Tight Tooth is new from Dianne Bates. Other authors include Sophie Masson and Victor Kelleher. Illustrations, in black and white, are by Tom Jellett. The stories can be read individually or read cover to cover and will stand repeated readings, either aloud or individually. Inside my cupboard was a tree – a miniature hazel tree no higher than the length of my hand from wrist to fingertips, but still a tree, perfect in every way…And as I stared, I saw a slight movement amongst the leaves, a rustle carried by a wind I couldn’t feel, a wind that came from – I knew not where. Once Selena was the must loved and pampered daughter of a wealthy noble and his cherished wife. Now, though, her mother is dead and Selena is Ashes, the lowest servant in the house, ignored by her father and mistreated by her stepmother and stepsisters. All that keeps her from running away is the death bed promise she gave her mother – to stay strong and not abandon her father. When her sixteenth birthday arrives, Selena is at her lowest ebb. Her father, it seems, has forgotten her birthday, and she is in trouble with her stepmother. When her father does remember his gift is simple – a twig from a hazel tree growing near her mother’s grave. It seems impossible, but this twig is the beginning of change for Selena. Its enchantments allow her to attend an elaborate ball, where she meets the Crown Prince. Moonlight and Ashes is a brilliant retelling of the Cinderella story, though it is as unexpected as it is beautiful. There is not a fairy godmother or a pumpkin in sight. Instead, Selena is a strong young woman who draws on her own resourcefulness, and the strength of her new friends, together with her newly discovered gifts, to grasp her destiny. There is magic in this book – it captivates and keeps the pages turning. This book is available from good bookstores or online from Fishpond. Buying through this link supports Aussiereviews. Eleven thousand metres up in the night sky, Sam Fetch sat slumped in an aeroplane seat, feeling very sorry for himself. How could his parents have been so cruel as to send him off like an unwanted package to some English relatives he hardly knew? Frankly, he didn’t care if he never got to know them. It was so long since he’d last seen them – more than six years, when he’d been only five. They may as well be total strangers. Why did he have to go there? Sam thought crossly. He was certain it would rain every day, and it would be weird spending every minute indoors with people he hardly knew. Sam’s parents are bird-watching in the Arctic for the summer, and because he complained so much last time, that they’ve found somewhere else for him to be. Only that’s promising to be even more dull and boring than bird-watching. He remembers only little about his English cousin, but what he remembers he doesn’t like. Not that Jenny’s much more thrilled when she discovers that she has to look after Sam. Her parents have been called away on an important mission and she’d much rather have gone with them. After all, she’s a Boggle Hunter too. Boggles are nasty pests, a ‘by-product of the cold war that has always existed between the rival faery tribes known as the Fays and the Grays. Boggles are created by Grays to cause havoc in our human world, while Fays must constantly work at detecting and destroying boggles before they cause that havoc. When Sam and Jenny re-meet, they are no keener to spend time together than previously. Both have plans and are happy to agree to go their separate ways. And those ways are as far from each other as possible. Boggle Hunters: Game On is the first title in a new series for young readers. Fay and Gray folk are warring faeries with very differing views on the importance of Earth and humans. Boggles are responsible for all sorts of earthly disruption from computer glitches to crop failures. There are secrets everywhere and the reader must be constantly alert for clues as to who is on the side of good and who supports evil. Sam and Jenny find their own way and make their own decisions, but the ways they choose do not always lead where they expect. Computer gamers will enjoy Grim’s Castle which captivates Sam. Fantasy readers will track Jenny’s adventures and race to the conclusions with her. Recommended for mid- to upper-primary readers. This book is avaialable online from Fishpond. Buying though this link supports Aussiereviews. At that moment, a man stepped out of the bush and all other thoughts fled my head at once. Short, bearded, middle-aged, wearing a wide-brimmed hat and good clothes with too-large boots, he could have looked like any other traveller. That is, if you ignored the pistols in his belt and the double-barrelled shotgun he was levelling at us. Hugo is new to Australia, travelling with his French father in search of exciting stories of the gold rush. But before they reach the gold fields they unwittingly become part of a story themselves, when they are held up by the bushranger Harry Power. Afterwards, Hugo’s father decides that the story of the bushrangers is a far more exciting one, and the pair decide to spend some time in Benalla. When Hugo defends a girl against the tirades of a shopkeeper, he makes some unexepected friends, particularly the girl’s brother, the friendly and fiercely loyal Ned Kelly. Hugo is upset at the poor treatment and judgement levelled at the Kellys, especially Ned, but as their friendship grows he learns more about Ned Kelly’s secrets. Ned Kelly’s Secret is an absorbing historical tale for upper primary aged readers. Telling just a small part of Ned Kelly’s story through the eyes of a visitor to the country, who nonetheless finds common ground with the young Ned, provides a unique version of events. The story also provides a glimpse at the history of the times, with attention given t travel, landscape and social structure in a way which informs without overtly seeming to do so. Likely to appeal to ages 10 and up. This book is available in good bookstores or online from Fishpond. Buying through this link supports Aussiereveiws. Annie’s dad has been away fighting in the Great War for two years leaving Annie and her mum at home in Australia. But Dad’s letters have stopped coming, ad Annie’s mother is sick with worry, so she’s decided to do something about it. She will travel to France to find him. Soon Annie and her Mother, who is French, are in France trying to find out what has happened to Dad. As she pieces together the clues to her father’s disappearance, Annie finds out for herself what war is like. My Father’s War , part of the My Australian Story series, presents a fictional first person account of the events and impact of the first world war on a twelve year old girl. Told using diary format, Annie’s mixed parentage and feisty nature enable the reader to experience the war first hand as she travels through the war zone in search of her father. Excellent historical fiction for primary aged readers. This book can be purchased in good bookstores, or online from Fishpond .